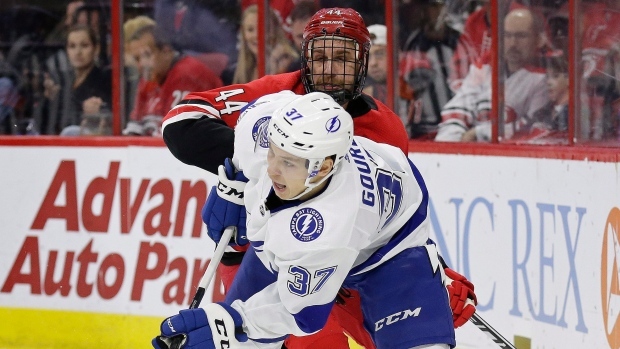 Tampa Bay Lightning forward Yanni Gourde has been suspended two games for an illegal check to the head on Carolina Hurricanes forward Jordan Staal, the NHL's Department of Player Safety announced. During Thursday's contest, Staal was battling for the puck along the boards with Ryan Callahan and Staal appeared to begin to fall forward after losing his balance. Gourde, who was skating in from his left, delivered a blow to Staal's upper-body as he fell. Gourde was handed a match penalty for the hit. Staal's teammates immediately rushed to his defence, mobbing Gourde after the play. Staal headed down the tunnel to get checked out but returned to the bench for the start of the second period. "It’s a fast game, and things happen. Obviously, you never want to see those hits. I was fortunate enough to come out of it feeling all right," Staal said after the game. "The hit on [Staal] was really scary," Hurricanes head coach Rod Brind'Amour said. "Hits to the head are always scary, especially with the history. He seemed to bounce back pretty well. He had a pretty good game." Staal missed 32 of 34 games earlier this season with a concussion but has eight goals and 12 assists in 41 contests this year. Tampa Bay went on to win the game 6-3 for their seventh victory in a row. While Gourde was held off the scoresheet, Staal recorded a goal and an assist in the loss. Both teams will be back in action on Saturday but will not meet again during this regular season.